LOS ANGELES - UCLA sixth-year senior and 2018 NCAA team and balance beam champion Christine Peng-Peng Lee was named the Honda Sport Award winner for Gymnastics, as announced today by Chris Voelz, Executive Director of THE Collegiate Women Sports Awards (CWSA). The Honda Sport Award has been presented annually by the CWSA for the past 42 years to the top women athletes in 12 NCAA- sanctioned sports and signifies “the best of the best in collegiate athletics”. With this honor, Lee becomes a finalist for the Collegiate Woman Athlete of the Year and the prestigious 2018 Honda Cup which will be presented on a live telecast on CBS Sports Network on Monday, June 25, 2018, in downtown Los Angeles. "I am extremely honored to be chosen as the winner for the sport of gymnastics. This award is as much mine as it is my teammates’,“ said Lee. “I have been here for six years, and I have never experienced a team like this one. They have all made such a positive impact in my life, and the bond we have created is what made all of our success this year possible." 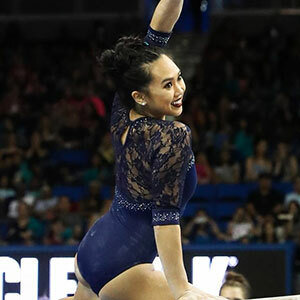 In her final competition of her career, Lee scored perfect 10s on her two events – uneven bars and balance beam – to lead UCLA to its seventh NCAA title and first since 2010 in a stunning come-from-behind victory. With UCLA trailing by 0.375, Lee’s perfect 10 on uneven bars helped the Bruins close the gap to just 0.175 going into the final event. With the meet on the line, Lee needed to score 9.975 on balance beam to take the victory, and she did that and more, earning her fifth perfect 10 of the season on the event. Lee also won the NCAA balance beam title with a 9.9875 to become UCLA’s fourth consecutive national champion on beam, and she also won the 2018 Pac-12 balance beam title with a perfect 10. The Pac-12 Gymnastics Scholar-Athlete of the Year, Lee finished her illustrious career with nine All-America awards and 10 perfect 10s, including seven in 2018. Her journey at UCLA was a long one, as she had to sit out her first two years due to an ACL injury that took her out of the 2012 Olympics. Lee spent the 2013 season rehabbing on the sidelines and was ready to come back for the 2014 season before learning that her ACL reconstruction did not hold, forcing her to undergo reconstructive surgery once again and sit out another year. She made her collegiate debut in 2015 and earned a total of four All-America honors. In 2016, a thumb injury and another knee injury limited her to 11 routines on the year, but she returned strong in 2017, becoming the Pac-12 Specialist of the Year and West Region Gymnast of the Year. Her sixth and final year at UCLA was historic, as she scored a school-record five perfect 10s on balance beam and added two more on uneven bars. Lee was chosen by a vote of administrators from over 1,000 NCAA member schools. Finalists included Sarah Finnegan (LSU), Maggie Nichols (Oklahoma) and Elizabeth Price (Stanford). Lee is the sixth UCLA gymnast to win the award but the first since Kristen Maloney in 2005. The Toronto, Ontario, Canada native is also the first international gymnast ever to win. Honda Sport Award winners will be presented with the honor during on-campus presentations throughout the year. The CWSA, in its 42nd year, honors the nation’s top NCAA women athletes recognizing superior athletic skills, leadership, academic excellence and eagerness to participate in community service. Since commencing its sponsorship in 1986, Honda has provided more than $3.1 million in institutional grants to the universities of the award winners and nominees to support women’s athletics programs at the institutions.